Telgua is the national phone company– they’re the only game in town. So, when you complain to them that they never answer their customer service number, they really don’t care. Just one advantage of being a monopoly I guess. Anyway, we tried to get the representative helping us to give us his cell phone number in case we had any problems with our service in the future. 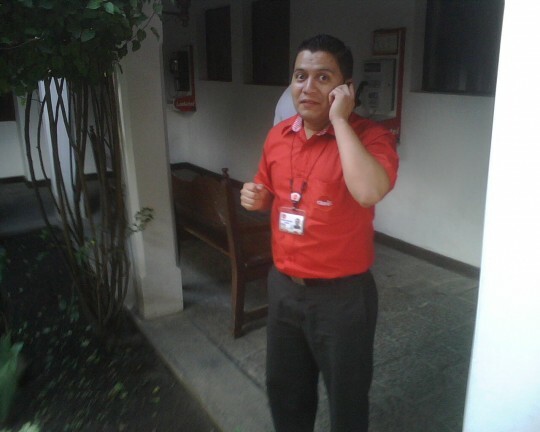 In Guatemala, it’s pretty common for a salesperson, bank teller, dry cleaner or whatever to give you their personal cell number instead of their company’s land-line. Anyway, dude said they weren’t allowed to do that, because Telgua employees aren’t permitted to use their cell phones at work. He told us this as literally three different red shirts sauntered by his desk blabbing on their mobiles. Kara snapped this awesomely incriminating pic soon thereafter. Posted on Wednesday, October 7th, 2009 at 2:11 pm. Filed under: Blog, Team Guate	RSS 2.0 feed.